The absolute best part of owning a small business is working with other small business owners to help them grow their businesses. 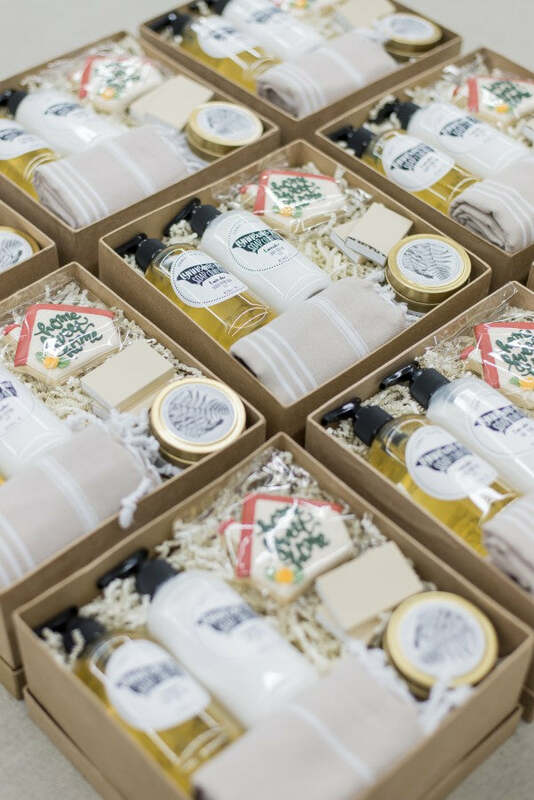 I love the challenge that comes with expressing a business owner's brand in the form of a gift. 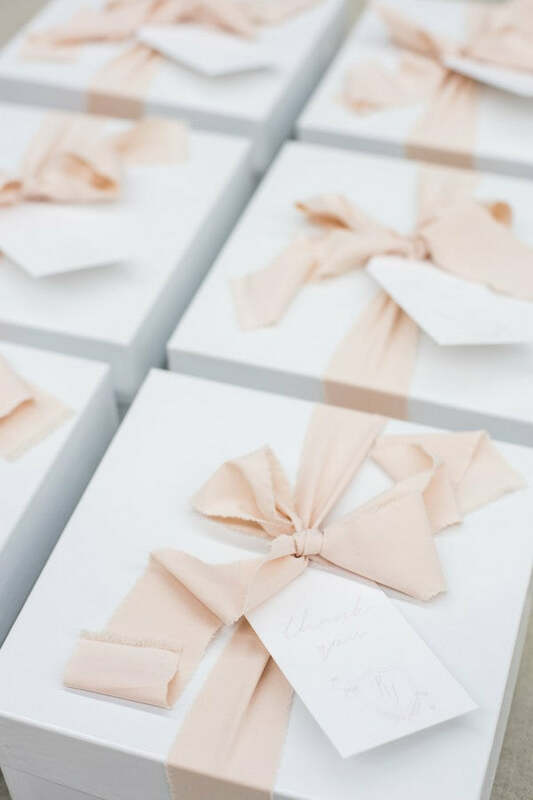 It brings me joy to know that not only are we helping them improve their client experience, but we're also taking the heavy lifting of gifting off their shoulders so they can get back to focusing on the core of their own businesses and doing what they're best at. I'm SO excited to share with you our Top Client Gift Designs of 2017...here we go! 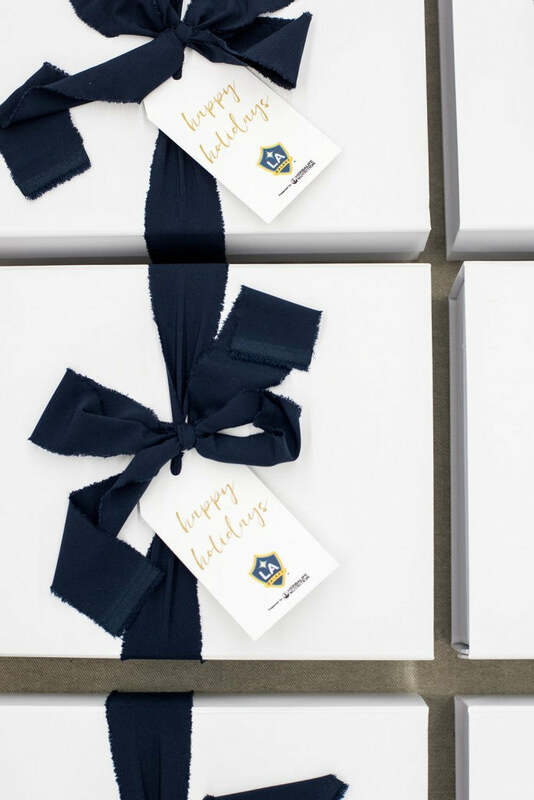 Between the project we did for the Anaheim Ducks and these for the LA Galaxy, we were beginning to think that 2017 was the year of the sports teams! We took inspiration from their branding colors, navy and white, and also included touches of gold to play off the yellow in their logo. The idea was to create traditional food and drink centered gifts featuring artisan coffee and hot cocoa, branded mugs, and small batch biscotti by Buttercream Bakeshop. 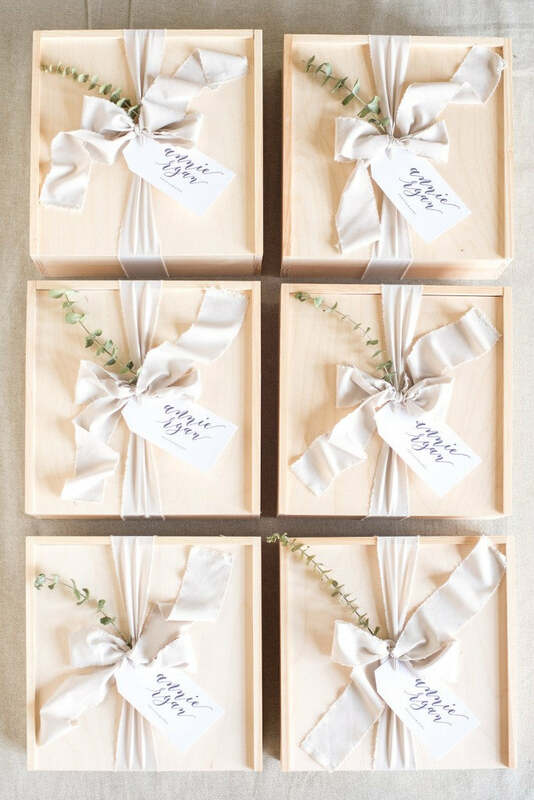 We used flowy navy ribbon by Torn & Tied along with custom branded gift tags by Just Write Studios to finish off the crisp, traditional white gift boxes. 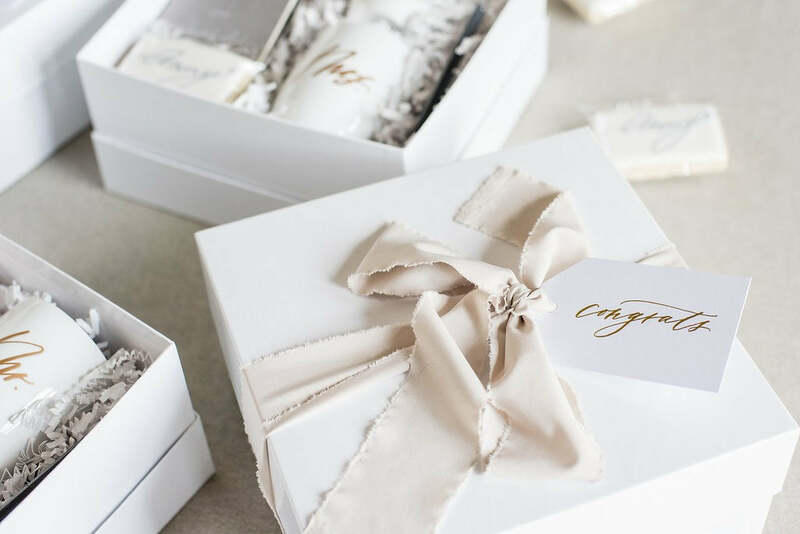 DC area wedding planner Caroline Dutton of Caroline Dutton Events wanted help creating custom holiday gifts for her clients that would accurately reflect her brand and we were happy to jump in! 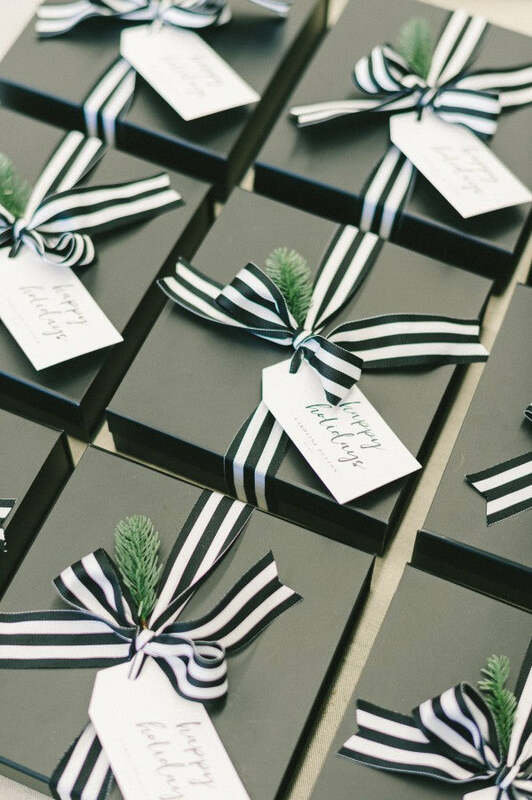 In order to achieve a clean, modern, classic look reflective of her style, we selected black gift boxes with striped grosgrain ribbon and branded gift tags. Contents included useful home decor items such as gold foil holiday post-it notes, grey and white tea towels, along with an artisan candle. Custom, branded holiday notecards were included for a festive, personal touch. Fresh pine and pine cones finished off this seasonal look. 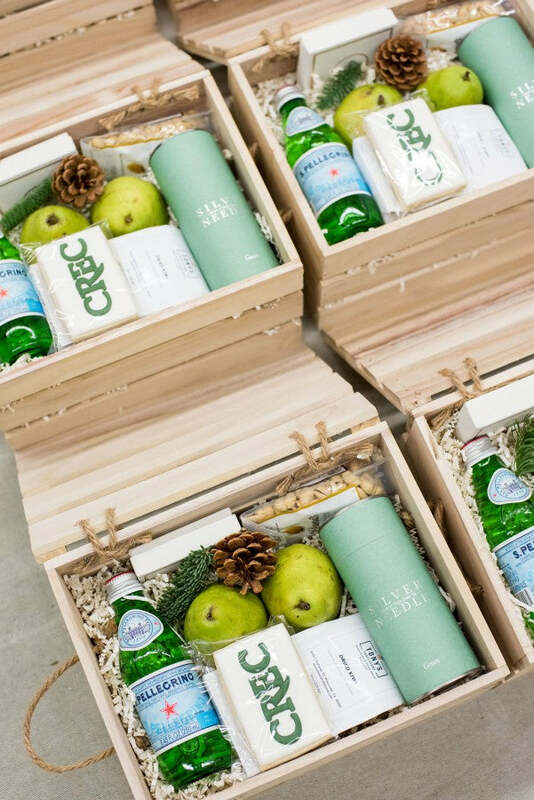 CREC manages commercial real estate properties in Miami and Ft Lauderdale and every year, each location loves gifting their tenants for the holidays. Their corporate culture embodies health and wellness so naturally they wanted to reflect these core values in the gifts. We used pine crates for a fresh, natural vibe and in addition to chocolates and peanuts, we also included healthier options such as pears, dried kiwi, tea and sparkling water. Custom logo gift tags and insert notecards finished off the gifts along with bright red, festive ribbon! 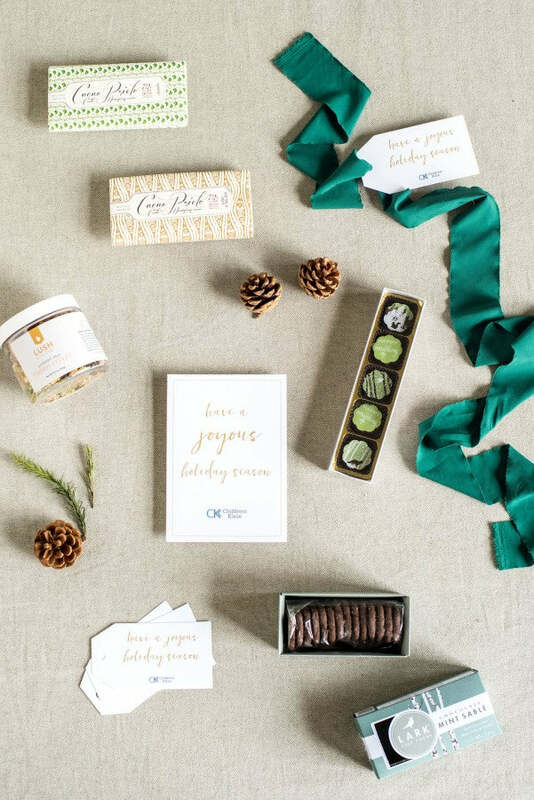 Katie Durski, founder and owner of Ribbon & Ink, has been a client of ours from the very beginning and I've loved being a part of her evolving brand and her gifting program as well. 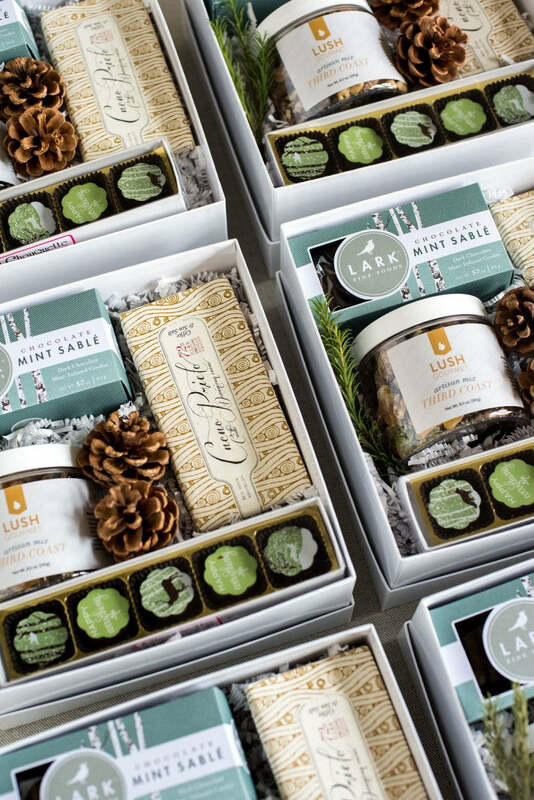 For her most recent gift design, Katie asked us to create a spa-like experience for her clients along with providing some elements for styling since, after all, she does branding and web design for creative entrepreneurs. Perhaps you recall seeing these when we shared them earlier this year here? 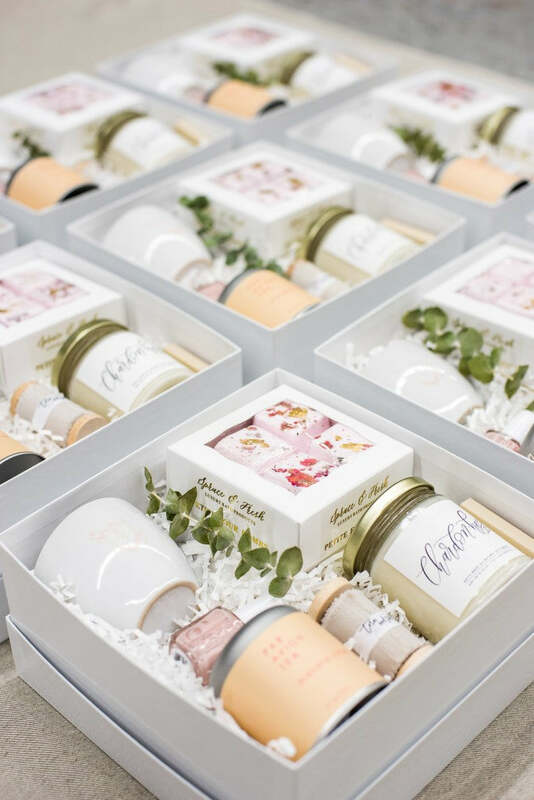 We chose crisp white boxes and filled them to the brim with relaxation items such as bath bombs, a candle, a tin of tea and an entire spool of Torn & Tied ribbon. 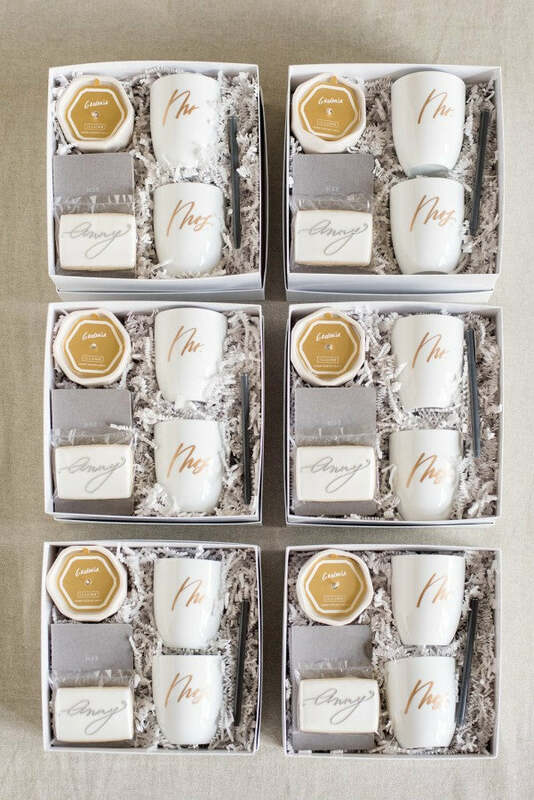 We incorporated the Ribbon & Ink logo on the gift tag as well as adorable little tea cups. Ann Hoang, owner and founder of Anny Photography, is another client we are proud to say has been with us since we first opened our doors in 2014. As Ann's brand has evolved, so have her gifts. She has gone from a more feminine, playful look to a much more neutral, soft and sophisticated look. 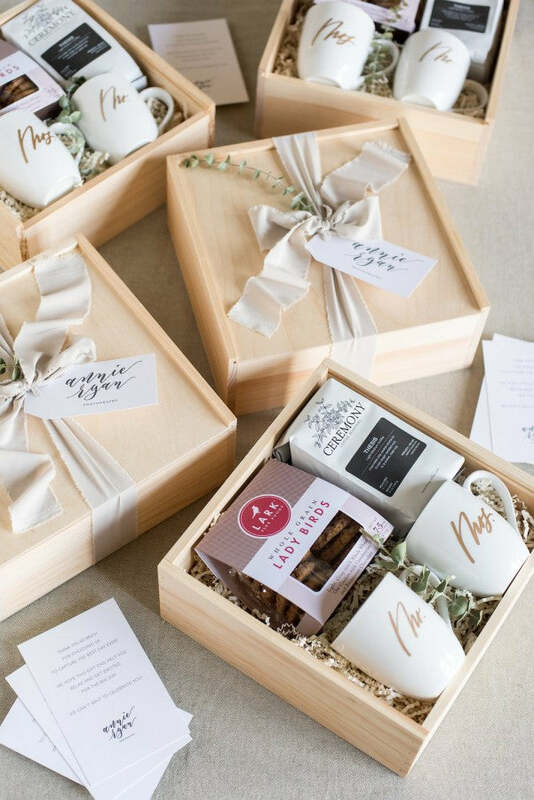 It was such a joy completely reconfiguring her curated gift boxes this year by selecting crisp white boxes, a set of his and her vow books, Mr & Mrs mugs, and an artisan candle. Gold foil "congrats" tags and flowy taupe ribbon finished off the look! Confession. These next gifts were designed for my very own Mom. But I'm not being biased, they truly ARE a favorite. As a mortgage broker, the goal was to create custom gifts that could be sent to her clients immediately upon closing on their new home. 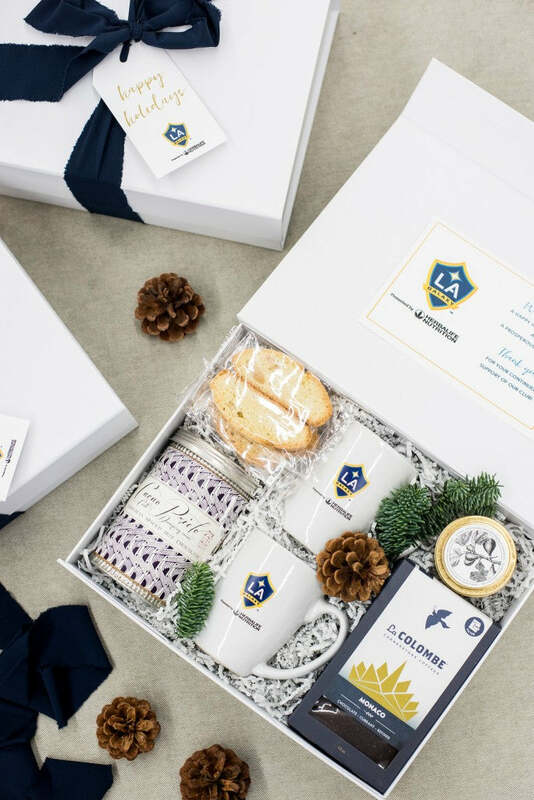 We selected kraft gift boxes for a comfortable, home-like vibe and filled it with an artisan candle by Brooklyn Candle Co and matches, a neutral tea towel, a small batch soap and lotion set and last but not least, a custom "Home Sweet Home" cookie in the shape of a house, by Sugar Studio. We included the Fidelity Mortgage logo on each gift tag and printed her license number just below it to remain compliant with the use of the logo. Whoa. This particular project was a challenge. In fact, I almost didn't accept the project because I was concerned it wasn't necessarily the right fit. But in reality, I was afraid that we would fail since the aesthetic wasn't our norm and so once my team assured me it could be done from a logistical standpoint, I got over my nerves and we pushed forward! It really forced us out of our comfort zone and big time. The client wanted gifts in a black, white and grey color palette (only) and we weren't allowed to use any basket fill to secure the items so we ended up learning how to use foam in lieu of basket fill. 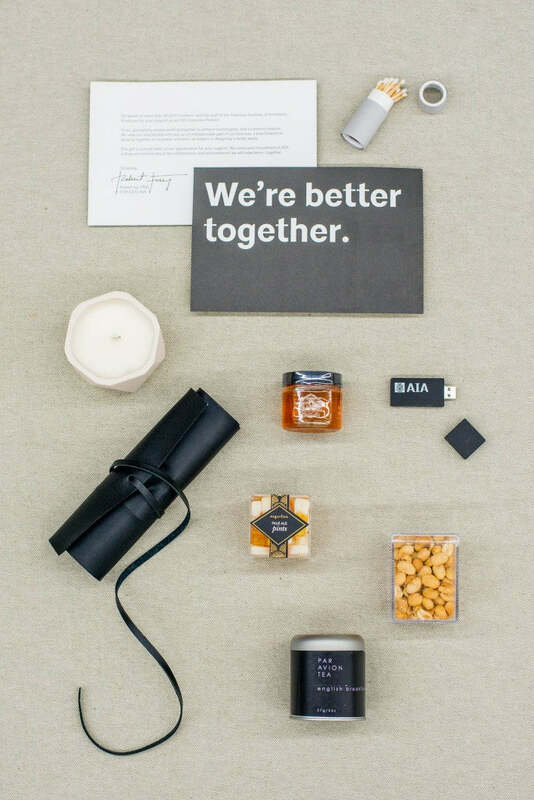 Not only that, but the items had to be in-line with their "Better Together" marketing campaign so the items not only had to be on-brand color-wise but also had to go together in thematic pairs. We came up with Sugarfina Pale Ale Pints and Virginia peanuts for "beer and nuts". We used tupelo honey and small tea tins for "tea and honey". We used an artisan candle and match box for "candle and matches". Despite the challenges, this project delighted the client and has ended up being one of the projects we are most proud of in the history of Marigold & Grey! Parrish Orthodontics has multiple locations in their large practice and receive referrals from countless dentists in the area. 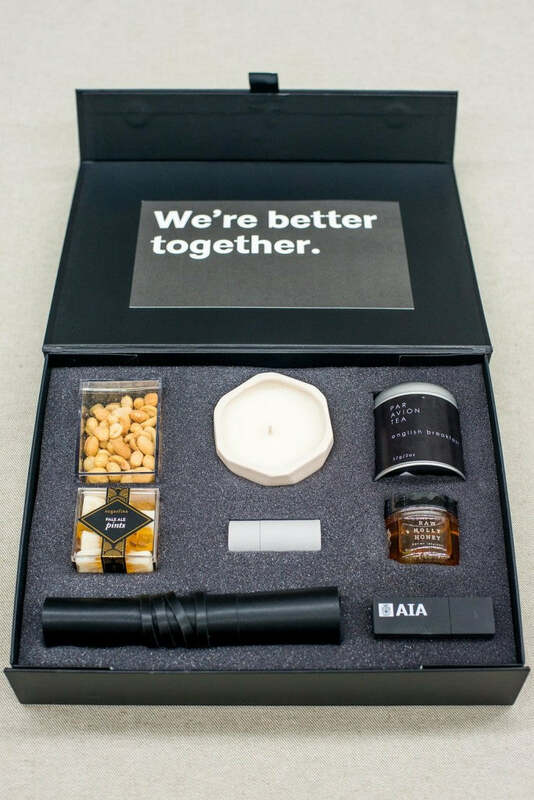 Naturally when the holidays roll around, they want to do something nice to thank the referring dentists for all for the patients they're sending their way. 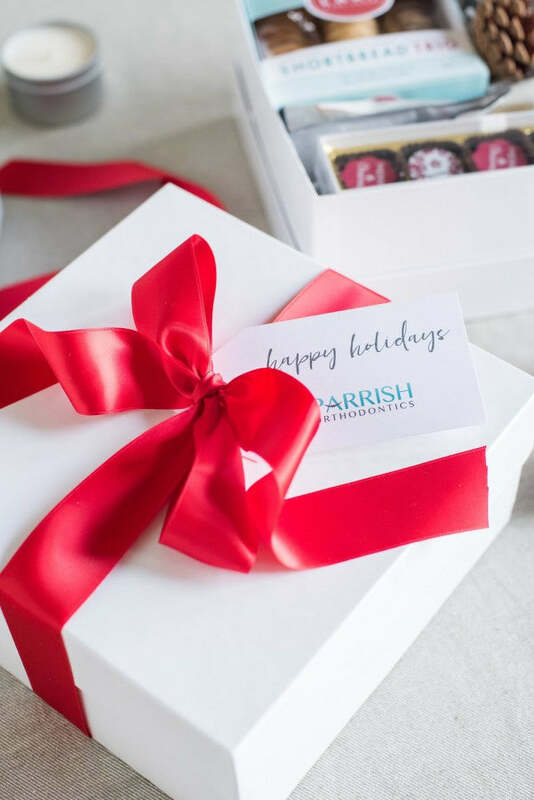 This year, Parrish wanted to do something unique and fun that would get people's attention and stand out amongst all the other gifts coming through the door in December. We used the aqua in their branding and paired it with bright red for a fun, festive spin on the traditional holiday red and green. 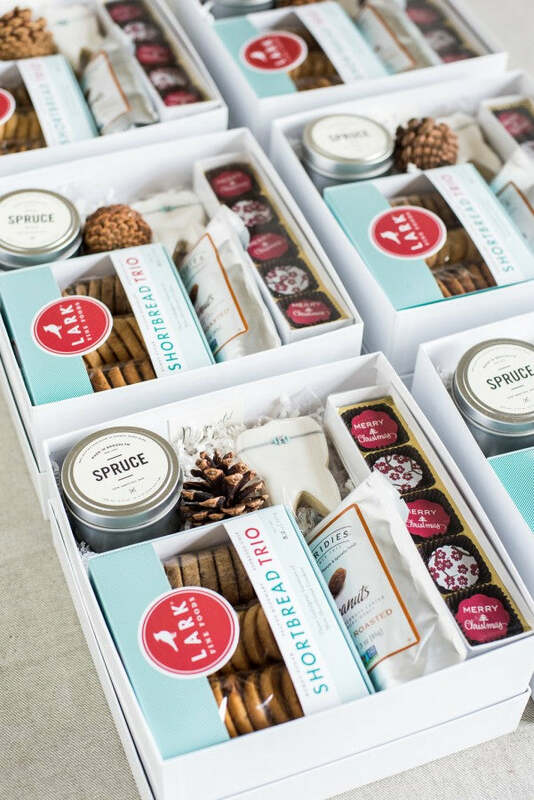 We included a trio of gourmet cookies, holiday themed chocolates by Chouquette, Virginia peanuts and an artisan candle by Brooklyn Candle Co in a spruce scent. But the most unique part of all...custom cookies in the shape of a tooth with braces. Just love what Sugar Studio came up with for these! Custom logo gifts tags by Just Write Studios and red ribbon finished off the look. 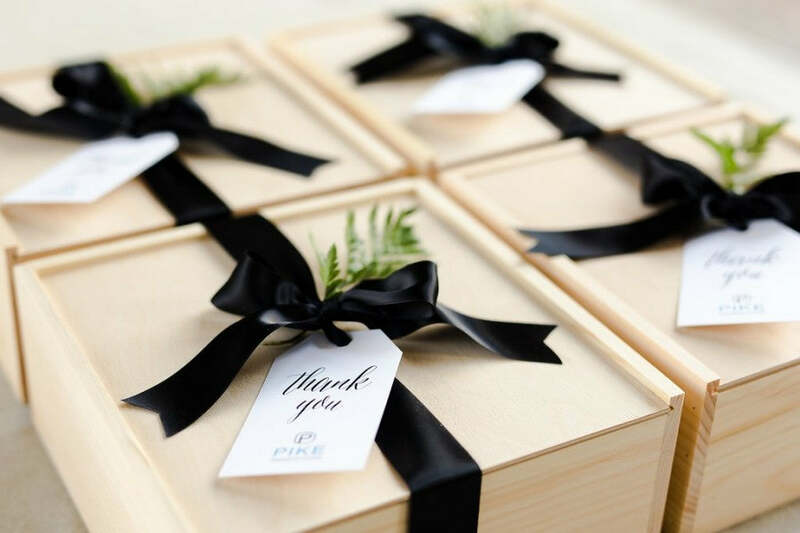 When Bruce Pike, owner and founder of DC-area Pike Productions, was looking for custom gifts for his local DC clients, we immediately knew we wanted to take these gifts in a local-to-DC direction! 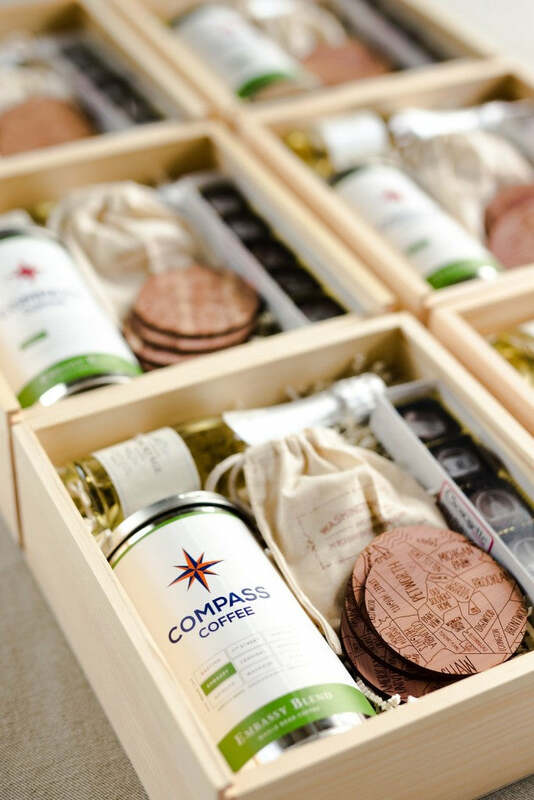 Contents included cedar coaster sets etched with the neighborhoods of DC, Compass Coffee, DC monument chocolates and more. We finished the gifts off with logo gift tags and deluxe black satin ribbon. 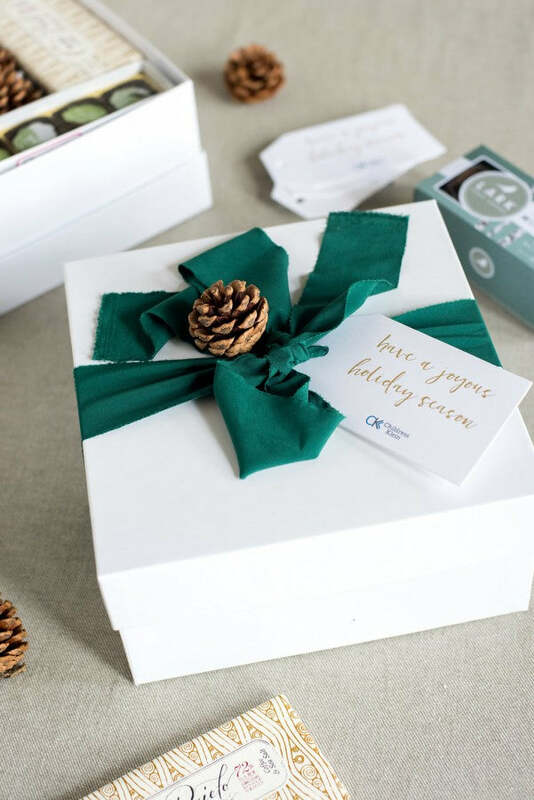 Commercial real estate firm Childress Klein wanted to send holiday gifts to their clients that would not only stand out, but also delight their recipients! 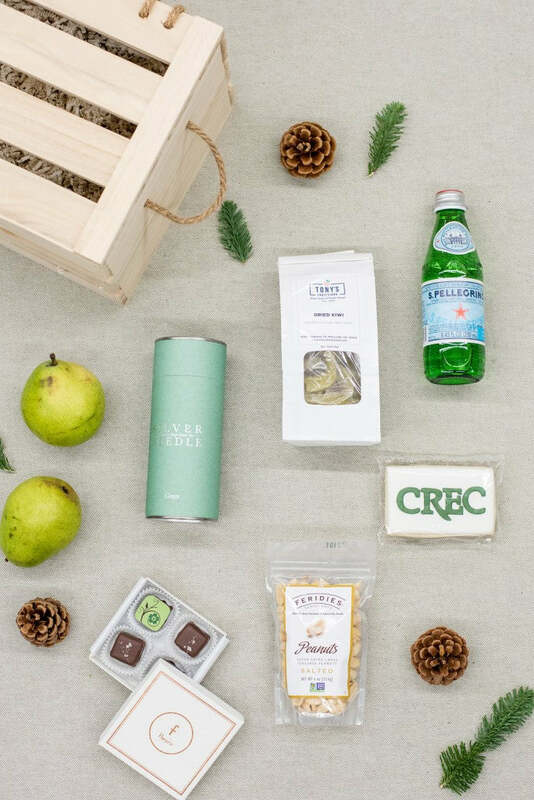 We kept the curated gift boxes food-focused and used a traditional holiday palette of greens and golds. We selected deluxe white gift boxes to hold gourmet nuts, holiday chocolates, gourmet coffee chocolate bar and mint small batch cookies. Custom holiday notecards and matching logo gift tags were created. We finished them off with fresh greenery, pine cones and emerald ribbon by Torn & Tied. Last but definitely not least, I'm thrilled to feature these organic-inspired wood gift boxes we created for Annie Ryan Photography. It was important to Annie that upon booking a new couple, that she would send gifts that were intended for both the bride and groom, rather than just her brides. With this in mind, we opted for a Mr and Mrs mug set along with small batch Ceremony Coffee. 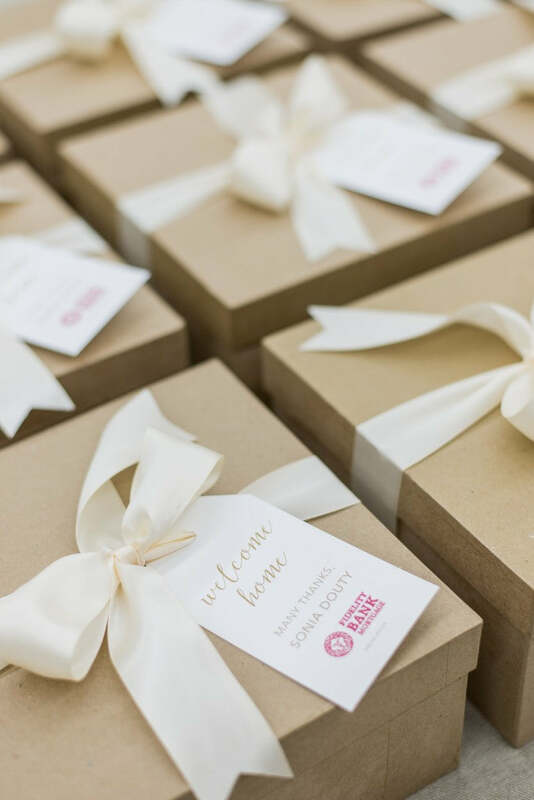 We also included a large package of gourmet cookies for the Annie's couples to share together. 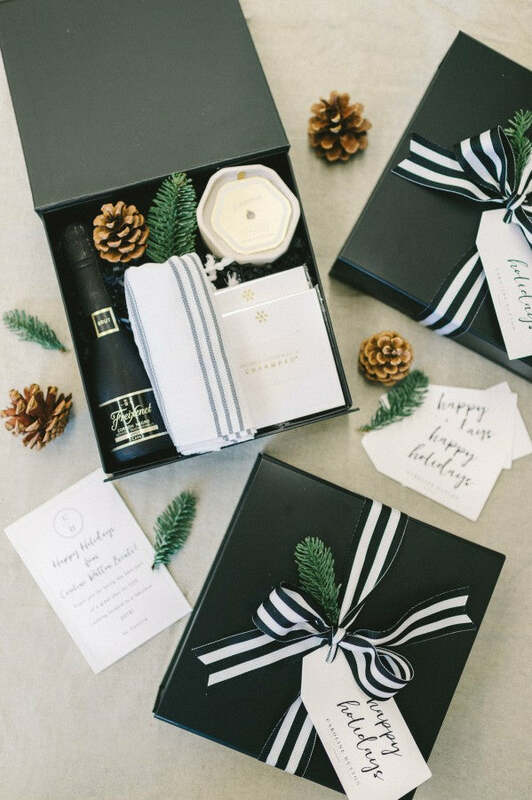 With the help of Just Write Studios, we created black and white logo gift tags along with custom welcome notes and finished each curated gift box off with a eucalyptus sprig silky taupe ribbon. Now that you've seen our lineup, we're dying to know...which one is YOUR favorite and why? For my information on custom client gifting with us, visit HERE or email us at hello@marigoldgrey.com. We always love to hear from you!